First things first: when you arrive as a visitor in a new city, check out the free city walking tours! These help you orientate yourself, give you a big-picture overview of what the city’s all about, and show you how to experience it to the fullest. Prague offers many tours around the Old Town, New Town, Jewish Quarter and of course the night life. The easiest way to find them is to head to the beautiful Old Town Square; in peak season there will be colourful umbrellas everywhere as the guides make themselves known and attract tourists and travellers alike to join the journey. This is a crazily decorated wall hidden in the back streets, full of art relating to the Beatles' music and John Lennon and his time. 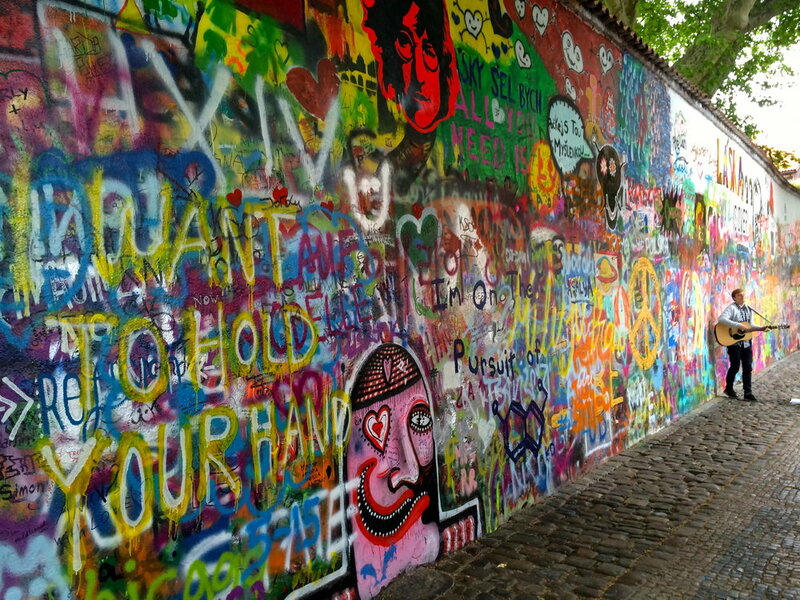 The art began appearing in the 1980s when young Czechs wrote their grievances on the wall in opposition to the Communist regime and their collective movements gained momentum and were then labelled 'Lennonism'. Now it's a big symbol of peace and love; forever changing as new layers are painted, and a popular place to take photos. The original Pilsner beer comes from a Czech town called Pilsen, about an hour away from Prague. It’s called ‘Pilsner Urquell’ and can be found in any bar or pub, along with traditional dishes like goulash. This is a thick hearty stew usually made with meat and spices like paprika and served with a soft doughy dumpling-like bread called knedliky. If you back off the main streets a little you might find this tasty combo a little cheaper and spend the extra coins on another beer….! With an ice cream stall around every corner and one scoop for 30 CZK (just over a euro), this might well be something you do more than once… and why not?! There are incredible flavours to try and the smooth creamy texture melts on your tongue quicker than the hot day can make it run down your fingers. The Old Town Square is a perfect place to sit and watch the world go by as you enjoy a little break and soak up the atmosphere of your holiday. Prague Castle sits magnificently up on the hill and as you lay eyes on it from the river for the first time you might truly feel like you’re in a fairy-tale. As you start up the hill the incline will begin to tug at your legs, but you’ll be so enchanted that you won’t stop until you get to the top! When you’re there you should definitely check out the Great South Tower; by climbing up the spiral stone staircase, you’ll be rewarded with panoramic views over the city that will take your breath away. This is a slightly odd recommendation… but keep reading! On the Eastern river bank, to the left of Charles Bridge as you face it, there's a sheltered corner of the river. If you peek over the railings and down into the water, you might see a giant rodent or two, either swimming or walking along a ledge. Some of them are about 3 times the size of a cat! It’s well worth checking out – where else can you expect to see wild water rats just going about their daily business? Beer cheese is an intriguing dish that you can order in a pub. The deconstructed plate consists of very stinky cheese, finely diced onions, mustard and spices such as paprika. On the side, there’ll be a shot of beer! The idea is you mash up everything on the plate, pour on the beer and keep mixing until it’s ready to be wiped onto a slice of bread and eaten. The smell coming from the plate can be pretty potent after mixing, so this is not for a table of people with weak stomachs or noses! There’s something about getting up before the rest of the city and seeing the streets in a different light. If you can get yourself onto Charles Bridge before 7am, you might see a few keen joggers and photographers with tripods, but other than that you’ll have the whole stretch to yourself. At this time, the water is still because the boats haven’t started up yet, and the streets are quiet because it’s too early for breakfast. If you’re looking for a bit of spatial relief after a busy few days, this is a very relaxing and meditative thing to do… and when you walk over the same bridge at 2pm in the middle of the crowds later in the day, you can’t help but feel a little bit smug. And, finally… it wouldn’t be a decent list without mentioning the nightlife. Prague can be as wild as it gets; it’s a popular destination for stag parties and the like, and the city bar crawl is one of the biggest in Europe. It isn’t difficult to find a good time here as people from all over the world hit the streets to celebrate their stay in the magical city of Czechia. The Castle is beautifully lit up at night and the bridges are full of romantic nooks and crannies to appreciate it from. Who knows, if you’re out late enough, you might even be able to achieve number 9 in the same night! Older PostThe Most Popular Places on Trafari!